Porsche’s GTS models have long made a strong argument as the enthusiast’s choice in the automaker’s lineup. With GTS models, Porsche offers its loyal customers go-fast bits from the top of the lineup at a price that makes them look like a relative bargain compared to the often eye-watering stickers of the Turbo cars and SUVs. The new 2017 Porsche Macan GTS is no exception, offering up the tenacious grip of the Macan Turbo, but at a sticker price not much higher than a Macan S.
From the Macan Turbo, the new GTS gets the electronically controlled dampers from the Porsche Active Suspension Management (PASM) package, but with an air suspension—a $1,385 option on the Turbo—added as standard equipment. The air suspension allows Porsche to give the GTS a lower ride height than its stablemates, sitting 0.4 inches lower than other Macans. The Macan GTS also gets the Turbo’s big 14.1 inch six-piston front brakes (single-piston 12.9 inch calipers from the S remain out back), and standard 20-inch wheels, running standard all-season tires like our tester, or optional summer rubber. 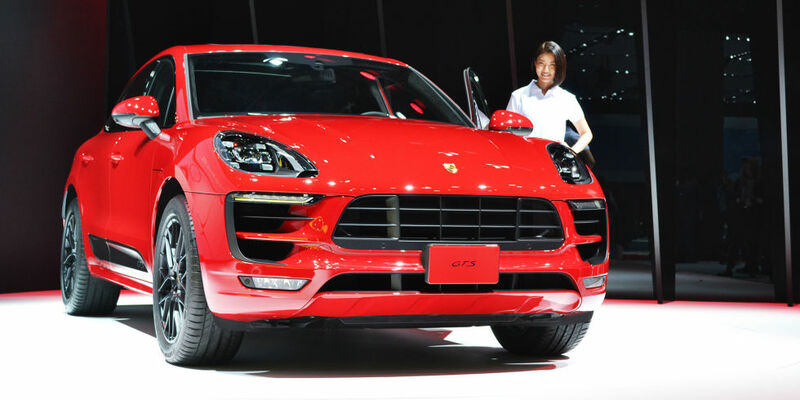 Despite the fact that the Macan GTS only now joins the lineup two years after the launch of Porsche’s small crossover, Porsche tells us that this model was actually the first version of the Macan developed. Fully aware of the enthusiast credentials GTS models lend to the lineup name, Porsche figured if it could perfect the GTS version early, the base Macan, Macan S, and Macan Turbo would capture some of that GTS magic too. That line of reasoning worked. The Macan S and Macan Turbo are among the best-driving SUVs on the road, and I’m happy to report that somehow the Macan GTS is even better. Proof of just how capable the Macan GTS package is seen in what Porsche had us do with the thing on its launch: race up the infamous Pikes Peak International Hill Climb course, with Pikes Peak-winning driver Jeff Zwart at the wheel. Even better, the Pikes Peak Highway would be closed for our run up the mountain, meaning Zwart—running point in his Peak-win—zning 2002 Porsche 911 GT2—would lead us up Pikes Peak’s 12.4 miles and 156 turns to 14,110 feet on the racing line, with the only limiting factor being whether I could keep up. As we rocket up Pikes Peak, it becomes apparent that the Macan GTS is a car that likes to be driven hard and fast. The PDK rattles off shifts automatically just as I begin to start thinking about shifting, and the ride and cabin are so well isolated from the outside world that it makes 80 mph feel like half that. I’d get in a lot of trouble if I owned one of these things. The revised traction-control system allows the driver to hang the tail out a couple degrees more than before, and works in conjunction with the optional torque-vectoring rear end to route power independently to either rear tire. The end result is that the Porsche allows you to brake late into hairpin corners, and use the throttle to help whip the rear end around and get you going the other way. As per the Sport Chrono pack, fourteen minutes and five seconds after we’d begun chasing Zwart up Pikes Peak, we hit the summit and crossed the finish line. Although far from the 9:46.243 time he ran last year at the helm of a Porsche 911, it’s about 25 seconds quicker than Bobby Unser’s first challenge victory in 1956. Zwart reckons he could get into the 12s were he to run the Macan GTS on race day. I, on the other hand, am working on a time machine; I’d like to see the look on someone like Unser’s face when they see an SUV like the Macan GTS ripping up the mountain like that.